Casper was out of contract but the Clarets were quick to give the former player a further year after coming so close to a promotion. "We want Frank to finish the job he has started for us," said chairman Frank Teasdale. "We felt that this season we fell at the last hurdle and we also feel that the manager should be given the opportunity to see things through. He knows the situation and, as ever, he will have the full backing of the board." Casper was delighted with the news and said: "I'm here to do a job. I was brought here to do that job and I am pleased to have been given another contract to finish it off. "Everybody is disappointed that the season did not bring promotion, but it's the best season we have had in the Fourth Division. Compared with the last two seasons it was excellent. "I have been given another chance and over the next 12 months we will do it. Jimmy Mullen will also be stopping on as my assistant and that is very important for the club. He has only been here for 12 months but has already made a big impression. He has done a great job for Burnley Football Club." With his position secure for another year he turned to the playing staff with four being given free transfers. Two of them were players who had played little part in the first team but the other two were the club's longest serving players. Midfielder Nigel Smith had been at the club for two years but made little impression whilst defender John Smyth hadn't featured at all in his first year. 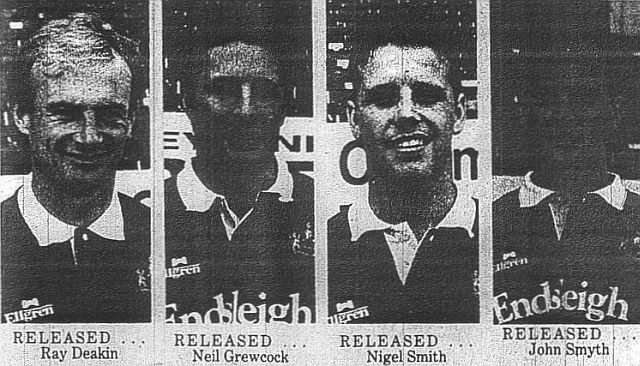 Both were released as were club captain Ray Deakin and winger Neil Grewcock, the last two surviving members of the team from the Orient game four years earlier. Casper admitted that letting Deakin go had been a difficult decision, but Grewcock had struggled with injury for three years. Grewcock had been with Burnley for seven years and had played over 240 games in that time. Deakin had been with the Clarets just two years less and he'd passed the 250 total. Nine other players were out of contract but all were offered terms for the new season as was young striker Graham Lancashire who had just ended his apprenticeship and had been involved with the first team in the closing weeks of the season. The nine to be offered new terms were captain Steve Davis, fellow defenders Ian Measham, Jason Hardy and Neil Howarth, midfielders David Hamilton, Joe Jakub and John Deary and forwards Peter Mumby and Danny Sonner.